With sharks being seen along the Outer Cape's shores, in Chatham, Orleans, and Eastham, there is a team of researchers that has been very busy. They are the Cape Cod Shark Hunters. The Shark Hunters have been spotting sharks from the air, trailing them in the water, and tagging them with tracking devices. 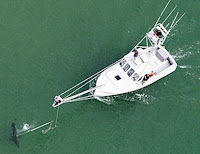 The Shark Hunters have a website, at www.CapeCodSharkHunters.com, where they have recent photos, a few videos, and info on the team and their techniques. Check it out! Image you are off the coast of Truro, simply sitting on your float, enjoying the waves and the beautiful day. Then you are greeted by 3 enormous humpback whales. Whoa!! Also, check out the story in the Boston Globe... here. 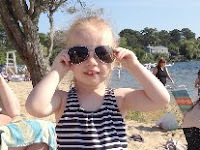 My August 2012 Report Is Available Now! 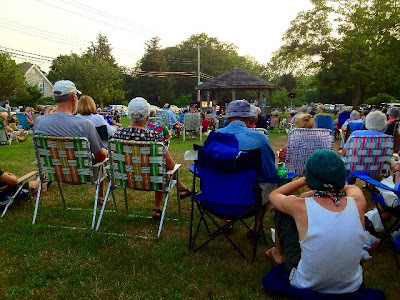 My August 2012 report is available now! This issue of my newsletter has the mid-year sales results for Eastham. Additionally, you'll find an article about having a beach campfire on the National Seashore and 3 new listings. This newsletter has been published every month for over 9 years. My aim, with my newsletter, is to provide accurate sales and market information about the Eastham housing marketplace, to add commentary and opinion (as appropriate), and to keep it interesting. Download your copy of my August newsletter now. I had the chance to go up to Eastham's Windmill Green to see tonight's free concert at the band gazebo. The music was provided by the Brass Connection Quintet, a group of 5 (imagine a quintet NOT be 5?) brass players. They performed familiar tunes, many from the movies and TV. There must have been over 200 folks there. Lots of fun for all ages. It's becoming the news of the summer on the Outer Cape. Friday there was a sighting at Nauset Light Beach in Eastham that cleared the water for about 4 hours. Check out the video from Boston's Channel 7 (WHDH). EASTHAM - New Listing - Just 0.3 miles from Cooks Brook Beach is a classic summer beach house waiting for your family. Beautifully decorated and surprisingly spacious, there's a big living room, an oversized front porch, and an eat-in-kitchen. There's an outbuilding, and a large front lawn. Also, the cottage has new windows, updated wiring, new ceiling fans and hot water tank. Fully insulated and heated. This cottage comes turn-key, fully furnished with only a few exclusions. Listed at $319,000. Go to http://290SteeleRd.robertsheldon.com for a Virtual Tour, and more photos. Easy to show - Come see! Seals in Truro - Shark Lunch? The is a spot in North Truro, about a half hour walk from the High-Head parking lot on Truro's ocean beach, where a large group of seals gather that is a sight to see. The seals, by the hundreds, enjoy the sun on a sand bar that emerges at low tide. The Cape Cod Times traveled there to capture the seals in a video...check it out. Where there are seals, there's likely to be sharks. EASTHAM - New Listing - Investment Property - Two homes, 1 to rent, the other to live in (or both to rent), with many updates and deeded access to Schoolhouse Pond. Close to National Seashore with it's Beaches and bike paths. The Front home is a 3 bedroom, 2 bath 1,715 sqft Cape that has been completely renovated and is a delight to see. 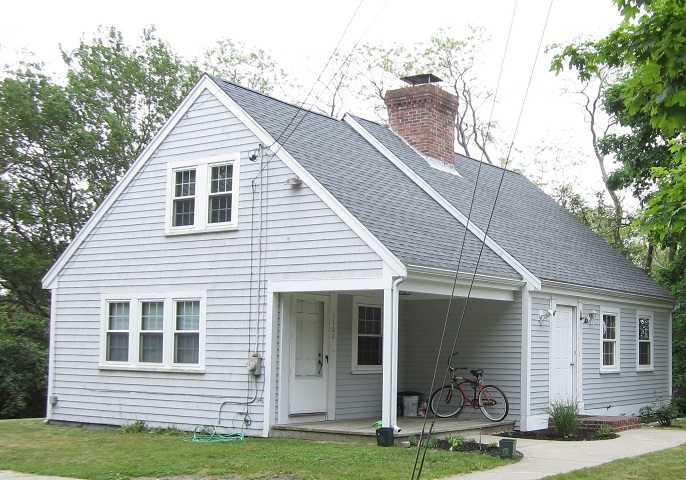 The Back cottage is 2 bedrooms and 1 bath, 752 sqft, and is a classic Cape Cod cottage. Both homes are currently rented and have stable tenants. Call me for details. Go to http://3100StateHighway.RobertSheldon.com for more information, a Virtual Tour and photos. Try something different this summer! There's nothing like eating a meal around an open campfire on the beach - lobster rolls, salads, cold drinks (no glass containers), & smores - while the little ones frolic on the uncrowded sand. 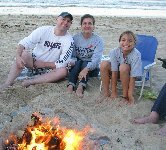 The Cape Cod National Seashore offers free permits to the Outer Cape Beaches (Nauset Light, Coast Guard, & Marconi) to have beach fires for small groups (up to 25 - varies by beach). The permits are very limited and need to be reserved at the Seashore Visitors' Center in Eastham a few days prior to your planned 'event'. On many mornings there's a line waiting at the front door to the Visitors' Center when it opens at 9 AM. I've personally waited over 2 hours for the permit. Go to the Seashore website for the details (http://www.nps.gov/caco/planyourvisit/permits.htm) . Swimmers were forced out of the water today at Nauset Beach, in Orleans, after a 12-14 foot shark was seen just a 100 yards or so off the beach. Sharks aren't looking for swimmers, of course, but have been known to attack humans while hunting for seals. Seals, on the other hand, have become plentiful these last few years in the Orleans, Chatham area. Check out this news video from earlier today. Eastham Sales - June Was A Huge Month! Eastham's June sales were a HUGE 19 sales. June's sales reflect the activity during the late spring, which was really good. This June's 19 sales is the highest single month's sales since October 2004. The details.. There were 19 homes sold in Eastham in June, up from May's respectable 11. The median sale price in June was 430K. There are currently 123 active single family listings in Eastham, with an average list price of $640K and a medium price of $449K. The average days-on-market is currently 227 days.